Omega Speedmaster Moonwatch "Dark Side Of The Moon"
With its ceramic case and Co-Axial caliber, the Speedmaster Dark Side of the Moon is a high-tech mechanical watch. State-of-the-art movements guarantee exceptional, chronometer-level accuracy. Its trendy look is inspired by the Moon's far side. The Swiss manufacturer Omega first presented the Dark Side of the Moon at Baselworld 2013. It is the modern successor to the famous Speedmaster Professional, the first watch on the Moon. Since then, it's become its own collection with many different models. The design of the Dark Side series is very similar to that of the original Moonwatch, but it forges its own path in terms of materials and technology. The watches do differ when it comes to case sizes, however. With a diameter of 44.25 mm, the Dark Side is 2 mm larger than the traditional Moonwatch. The case material is different, too. Instead of stainless steel, Omega uses black ceramic for the Dark Side. Even the dial is made of this hard and scratch-resistant material. A new, automatic, in-house movement—the 9300—powers the Dark Side watches. Unlike the manual 1861 movement, which powers the Speedmaster Professional, the 9300 caliber features a date display at 6 o'clock. The Speedmaster Professional has two separate subdials for its minute and hour counters, while the Dark Side relies on a more unique approach: It features just one subdial with two hands for both the minutes and hours at 3 o'clock. 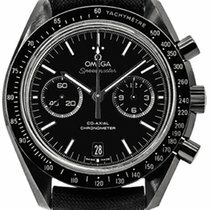 How much does the Speedmaster Dark Side of the Moon cost? Are you looking for a watch that combines tradition and modern technology? The Dark Side of the Moon has the classic Speedmaster Professional look from the 1960s but features new innovations, such as a ceramic case and Co-Axial caliber. Black is the dominant color in this Speedmaster collection. If you're looking for a functional chronograph, the Dark Side is a good choice. You can choose from among various editions of the Dark Side. The Pitch Black (reference number 311.92.44.51.01.004) is almost completely black, except for the light green numerals and index markers on the dial and bezel which are made of the luminous material Superluminova. 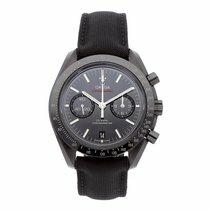 You can purchase a new Omega Speedmaster Dark Side of the Moon Pitch Black for a solid 8,700 USD. Pre-owned examples cost about 1,200 USD less. Unlike the standard Dark Side of the Moon with a nylon strap, the Pitch Black comes with a leader strap. What's more, the Dark Side of the Moon has somewhat wider indices and lacks any luminous material on its tachymeter scale. This model costs around 8,200 USD new and 7,500 USD pre-owned. The Black Black (reference number 311.92.44.51.01.005) is completely black. While it scores plenty of style points, if you're looking for a watch that's easy to read, you'll probably prefer some of the other models, such as the Sedna Black (reference number 311.63.44.51.06.001). It pops thanks to its Sedna gold hands, indices, date, and bezel edge. Sedna gold is Omega's own red gold alloy. The Vintage Black (reference number 311.92.44.51.01.006) is black except for its tan indices and numerals. It features a brown leather strap, which gives the watch a particularly retro feel. 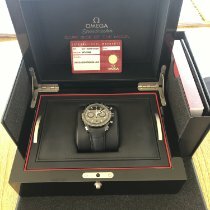 The price for a Speedmaster Dark Side of the Moon Black Black sits around 8,900 USD in mint condition and 7,600 USD pre-owned. The Sedna Black costs a good 10,100 USD new and about 8,800 USD pre-owned. Plan to spend around 8,600 USD for a Vintage Black on a black leather strap. The same timepiece costs around 8,100 USD pre-owned. The Speedmaster Dark Side of the Moon with diamonds is by far the most expensive chronograph in this series. Numerous diamonds ornament the bezel and indices of this black ceramic watch. You can find this model under the reference number 311.98.44.51.001. Be prepared to spend about 17,400 USD for a never-worn timepiece. In addition to the models in the Dark Side of the Moon line, Omega also produces some light-colored ceramic watches. For example, the Grey Side of the Moon features a gray case inspired by the color of moondust. As American astronaut Jim Lovell put it: 'The Moon is essentially gray.' This watch with a Co-Axial caliber and chronograph function comes with either a sandblasted platinum dial or a "meteorite" dial made from slices of the Gibeon meteorite. Each of these dials has a unique pattern, making every Grey Side of the Moon "Meteorite" one of a kind. This is all topped off by Sedna gold hands and indices as well as a ceramic bezel with a Sedna gold tachymeter scale and edge. 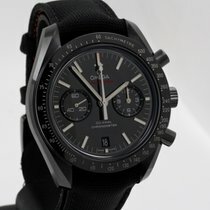 If you are interested in the Omega Speedmaster Grey Side of the Moon with a platinum dial, you will need around 8,700 USD for a new example and 7,000 USD for a pre-owned one. The Grey Side of the Moon "Meteorite" costs about 10,800 USD new and 9,400 USD pre-owned. The Omega Speedmaster White Side of the Moon is solid white and inspired by the Moon's radiance as viewed from Earth. Two small splashes of color on this chronograph include the red tip of the stopwatch second hand and the red 'Speedmaster' inscription. As a whole, this design feels a bit more feminine. The hands and indices in 18-karat gold add value to this 44.25-mm timepiece. The version with a mother-of-pearl dial and diamond-studded bezel is especially elegant. This model even features gold indices embellished with diamonds. White leather straps underscore the clean look of this series. You can purchase the version with diamonds and a mother-of-pearl dial for around 17,600 USD. The variant without diamonds is much more affordable at 8,700 USD. Pre-owned examples sell for about 7,600 USD. The name of this series has many interpretations. Omega dedicated the Dark Side of the Moon to the astronauts of the Apollo missions. The Apollo 8 mission in December 1968 played a particularly special role in the naming of the series: It was the first time that humans had ever seen the far side of the Moon with their own eyes. This only became possible thanks to space travel, as only one side of the Moon is visible from Earth. The Moon makes a full rotation on its axis in the time it takes to orbit the Earth one time. Scientists refer to this as tidal locking. The crew of Apollo 8 hadn't truly uncovered new territory, however, as the Soviet space probe Luna 3 had already photographed the dark side of the Moon in 1959. Furthermore, the dark side of the Moon isn't truly dark; it also receives sunlight. The phrase "dark side of the Moon" doesn't just refer to space. Mark Twain used it as a metaphor for the dark side of man, and music lovers know it as the name of the popular 1973 album by the British band Pink Floyd. Omega leaves the door open to interpretation with "Dark Side of the Moon." The watch has many qualities in common with the Speedmaster Professional, the official watch of the Apollo program. Both watches are chronographs and have a fixed bezel with a tachymeter scale, as well as a small seconds subdial at 9 o'clock. Two push-pieces control the chronograph functions: starting, stopping, and resetting to zero. Furthermore, both timepieces are water resistant to 50 m (50 bar, 164 ft). Omega pairs the base model of the Dark Side of the Moon and the Black Black version with a black Cordura strap. This material is more tear-resistant than nylon; it's used for belts, bags, and protective clothing for motorcyclists. The Pitch Black, Sedna Black, and diamond version all feature a black leather strap. Sapphire glass protects the Dark Side of the Moon on the dial side as well as the back. The words "Dark Side of the Moon" are engraved on the case back's edge. The watch's sapphire glass case back gives you a clear view of Omega's in-house caliber 9300. Omega made their own caliber even though they're a member of the Swatch Group and could source their movements from the world's largest ébauche manufacturer, ETA SA Manufacture Horlogère Suisse. ETA is also a member of the Swatch Group and provides manufacturers such as Tissot with movements. The caliber 9300 has a 60-hour power reserve due to its two barrels, and the movement is particularly shock-resistant with low friction thanks to its Co-Axial escapement. Furthermore, Omega chose to use a silicon balance spring to keep the watch unaffected by magnetism.